Not an essential purchase, but like so much of Paul Brett's signature range, its character is undeniable. Well made. Welcome USB inclusion. Yes, you've seen the acoustic Viator before, but this new version in Paul Brett's signature Vintage range is an electro with USB output. To recap, it's small. Centred around a 546mm (21.5-inch) scale length with diminutive body that's 279mm (11-inches) wide and 392mm (15.4-inches) long with a more conventional depth of 91mm and an overall length of 825mm (32.5-inches). In other words, we wouldn't have a problem sticking it in an overhead compartment of a plane or, more likely, a crammed-for-space car with the kids and the camping gear. 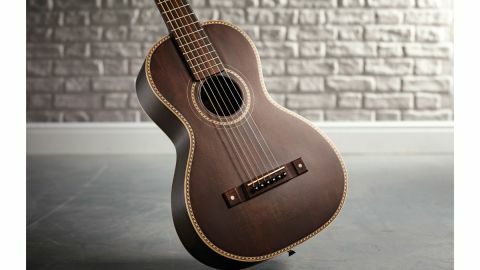 For the price, you can't complain about the build, although all the wood is hidden under an 'antique' brown satin finish that's extremely thin, allowing the grain texture of the laminated sapele back and sides - less so the solid Sitka spruce's top - to show through. Edges are maple bound and the top has oversized wood purfling, mirrored in the rosette decoration; internal bracing is spruce, including the top's 'custom scalloped' X bracing. As we've remarked before, the nato neck's profile, a pronounced 'V', won't be to everyone's taste. But the nut width, at 43.4mm with 37.5mm string spacing, and a string spacing at the bridge of just a shade under 54mm are definitely full size and we get medium-gauge frets, not small vintage wire, a nicely cut Graph Tech NuBone nut and compensated saddle. There are two strap buttons if you need them and the slot head has good-looking open-backed Grover tuners, although they have plenty of backlash; perhaps more to do with the relatively low tension of the strings which, as supplied, are tuned G to G which makes perfect sense as the scale length compared to, for example, the shorter of Martin's scale lengths means the nut falls midway between the 2nd and 3rd frets. Capo'd, even a small-bodied parlour or 00 is a hugely appealing sound either on its own or tracked with uncapo'd guitars, but the thing we don't have here is the body size to kick out anything near 'full range': the basses are tight, the highs a little soft, leaving us with a middly voice that has its own quite narrow character. It certainly falls short compared to Taylor's albeit more expensive GS Mini. But Paul Brett likes things different, and so long as you understand what the Viator can't do, you can begin to enjoy what it can. "The USB certainly adds immediacy for recording into a DAW; level seems fine and it sounds more like the amp'd sound rather than the acoustic voice, which, if we're honest, is an improvement." Certainly, that midrange sits nicely with a conventional dreadnought, and picked jazzier lines have a sort of tight-bassed, almost acoustic arch-top like tonality. The Fishman Sonicore system uses a soundhole-placed volume and treble roll-off tone control, although because of the small diameter of the aperture, they're not the easiest to get to. a more regular sound, although the lows sound a little waffly and, at any volume, might cause some feedback issues unless they're trimmed. The USB certainly adds immediacy for recording into a DAW; level seems fine and it sounds more like the amp'd sound rather than the acoustic voice, which, if we're honest, is an improvement. Intonation, despite the compensated saddle, is a little off kilter, however, as the octaves are noticeably flat to the 12th fret harmonic or open strings. For the most part, this is a nicely made and well-executed electro 'travel' guitar. The pickup, with its USB upgrade, certainly warrants the price hike from the existing acoustic version (which costs £209) and it's fun to play, with a pretty much full-size nut and bridge string spacing. Its acoustic sound is hardly full range, with a very tight low end, but amp'd or recorded, it takes a leap up, adding 'capo'd' tonality that's easy enough to EQ to sit nicely in a denser ensemble recording although the actual intonation on our sample was a little flat of perfect and those tuners feel a little sloppy and cheap.